The Yemayundrung Glacier flows northeast from the Nepal-China border to end in lake at the headwaters of the Khugpi Chu River. This river is one of the source rivers of the Yarlung Tsangpo (Zangbo) in China which becomes the Brahmaputra in India. This is a region where Li et al (2011) noted that increasing temperature, especially at altitude, the fronts of 32 glaciers have retreated, mass losses of 10 glaciers have been considerable, glacial lakes in six regions have expanded and melt water discharge of four basins has also increased. This is further documented by an inventory of 308 glaciers in the Nam Co Basin, Tibet, where an increased loss of area for the 2001-2009 period, 6% area loss (Bolch et al., 2010) was observed. 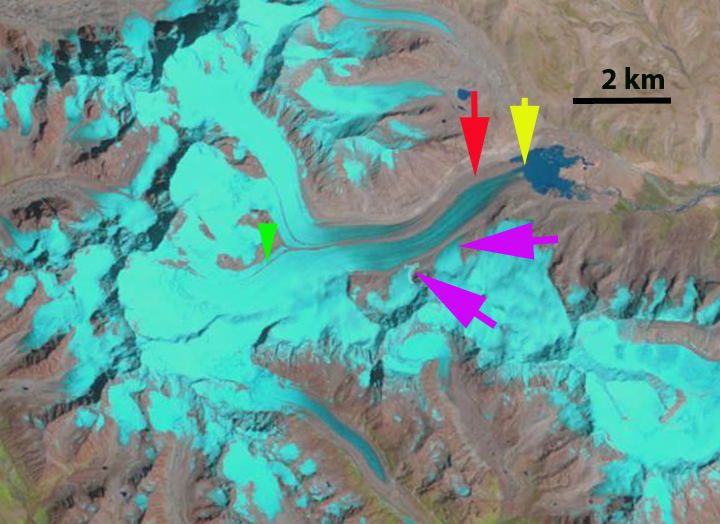 Here we examine Landsat imagery of changes in this glacier from 1998 to 2014. In each image the yellow arrow indicates the 1998 terminus and the red arrow the 2014 terminus. 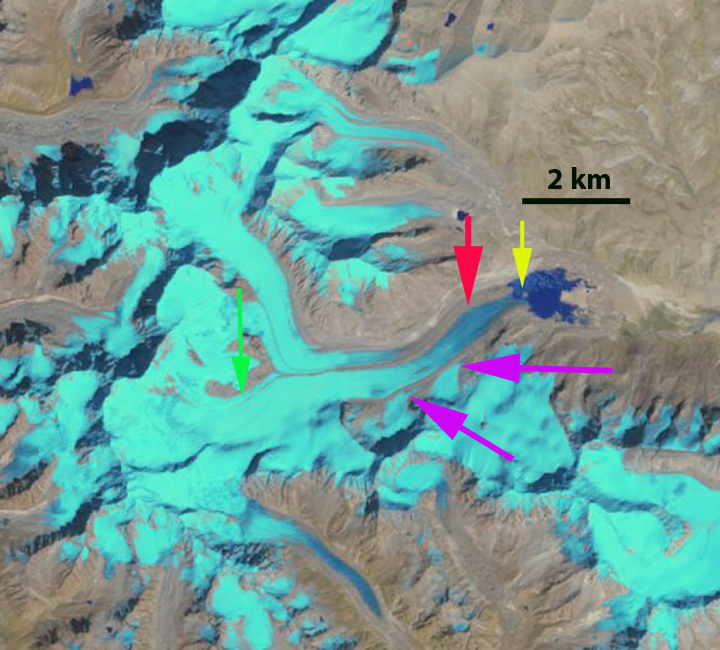 The purple arrows indicate a pair of tributary glaciers from the south and the green arrow a tributary after it has joined the main glacier separated by a lateral moraine. 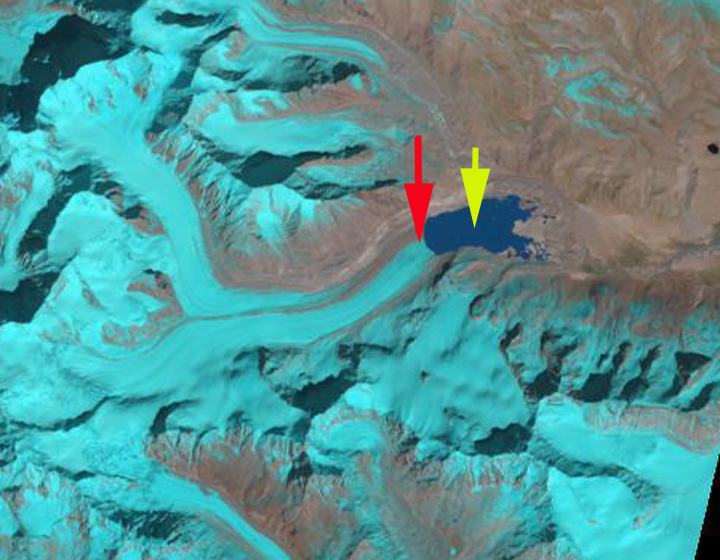 In 1998 the glacier terminates at the yellow arrow and the maximum length of the proglacial lake at the terminus is 1 km. The two tributaries from the south join the main glacier. The tributary at the green arrow has a blue ice tongue that extends down glacier to the main glacier junction. In 2000 the terminus has retreated a short distance, but there is little change in the tributaries. By 2013 the lake has lengthened to 1.8 km with glacier retreat. 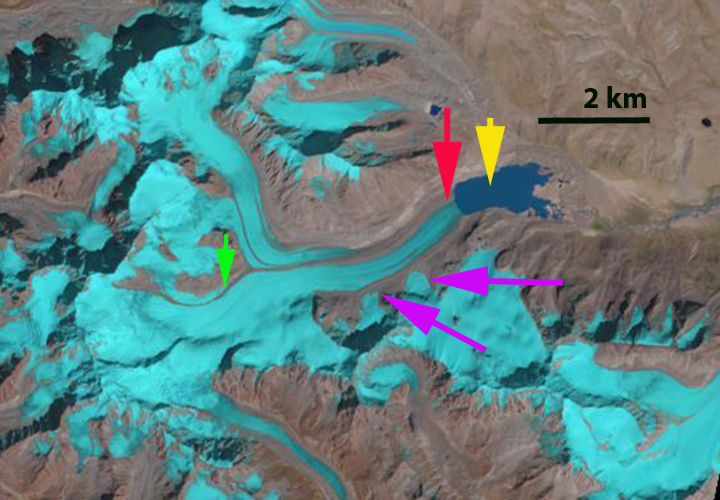 In 2014 the two southern tributaries at the purples arrows no longer connect to the main glacier. The tributary at the green arrow no longer has blue glacier ice extending past the arrow to the main glacier junction. The glacier has retreated 750 m from 1998-2014. 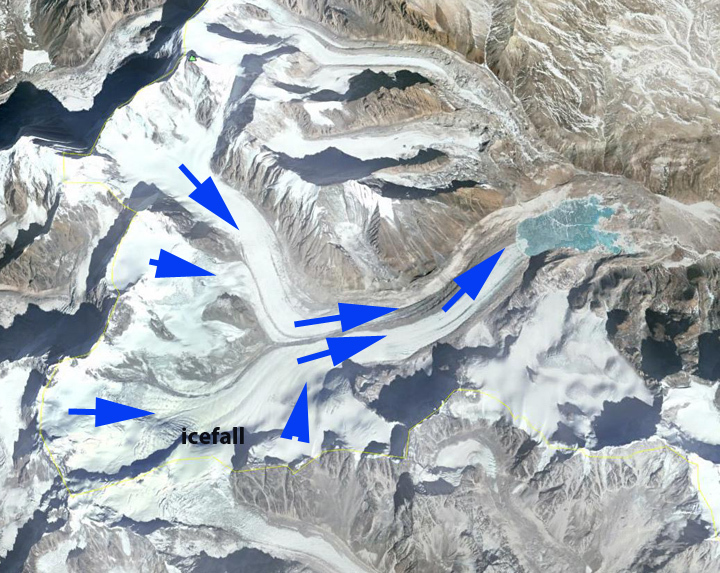 The thinning of several tributaries is indicative of less volume flux toward the terminus, which will lead to continued retreat of this glacier and lake expansion. The retreat is similar to that of Durung Drung Glacier, India, Reqiang Glacier, China and Matsang Tsanpo Glacier, China and Ribuktse Glacier, China, which are in a similar climate setting. This area did get an unusual heavy October snowfall from Cyclone Hudhud this week. This entry was posted in Glacier Observations and tagged brahmaputra glacier retreat, Tibet glacier retreat, yarlung tsangpo glacier retreat, yemayndrung glacier retreat. Bookmark the permalink.